I was never really a fan of “Little House on the Prairie” although I watched it with my wife and daughter. 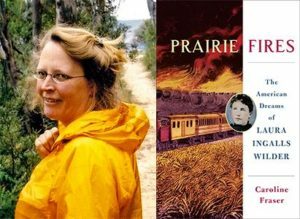 But I kept reading reviews and hearing from friends that Caroline Fraser’s biography of Laura Ingalls Wilder, Prairie Fires, was well worth my time and it was far more encompassing in scope than a life story. It also was a far cry from the biographies I usually read, like John Farrell’s Nixon, William Taubman’s Gorbachev, Viktor Sebestyen’s Lenin, or Richard Holmes’ Age of Wonder. So as March was ending, I began plowing [pun intended] into it. Fraser’s writing grabbed my immediately. And it was a story far larger than the cradle-to-grave account of Wilder’s life but what happened, why it happened and the consequences of thousands of farmers, enticed by railroad ads of fortunes to be made in forever fertile field and the Morrill Homestead Act of 1862 after planting acres, upon acres of wheat across a huge swath of the plains west of the Mississippi. What unfolds in Fraser’s work is a slow-developing tragedy of played-out lands, worn-out people. I was about halfway through Prairie Fires when the Pulitzer committee announced it had won the biography category. I was not surprised. Lillian and I had the pleasure of hearing her read — three minutes, part of the book — at the biographers’ conference in New York. I am a big fan of Prairie Fires. next post: When You Reach the Gulf of Mexico, Turn Left.